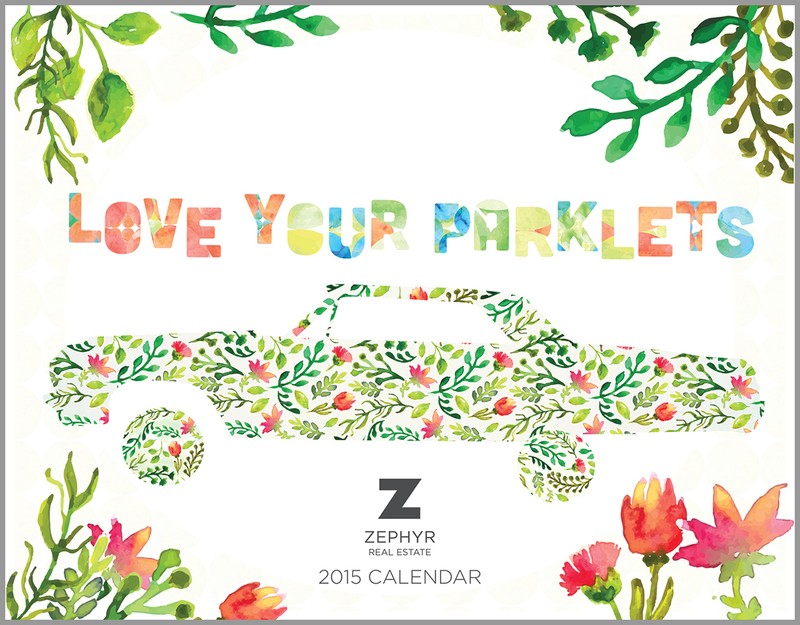 SAN FRANCISCO, CA--(Marketwired - December 04, 2014) - Zephyr Real Estate's 24th annual calendar has just been released for 2015, featuring parklets found in neighborhoods all over the City. The long tradition of San Francisco-themed calendars has nearly rendered these calendars as collector's items for a wide spectrum of local lore. Each year, Zephyr produces a San Francisco-themed calendar that focuses on different features that make San Francisco so unique, such as this year's parklets. Parklets are a trend that started in San Francisco as a way to create more useable outdoor space in our urban environment, and the trend is starting to catch on in other cities as well. Some parklets have the appearance of an al fresco dining experience, while others look more like an interactive art exhibit. Parklets are privately sponsored and maintained by local businesses and organizations, but are openly available for public use by all. As a way of giving back to the community to further enhance public outdoor space in San Francisco, Zephyr is making a donation to the San Francisco Parks Alliance for each calendar produced, which number in the thousands. In past years, calendars themes have included movies filmed or set in San Francisco, food and drinks invented, historic pubs and bars, great writers, mosaics, street slides and stairs, and saints and scoundrels. Each month presents a photo and a brief history as well as some of the renowned properties sold by Zephyr. To acquire a calendar, please contact any Zephyr agent or office. Calendars are free while supplies last. "Planning and preparing the calendars is an interesting process of discovery, and we always uncover new hidden treasures about the City," commented Melody Foster, Vice President of Marketing and Web Development for Zephyr. "There's so much history and inventiveness in San Francisco, we're sure there'll be many more unique theme ideas in the years to come."